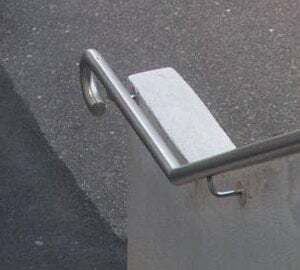 Handrails are important to all of us, but especially so for people who are blind or vision impaired, people who have a mobility disability (but able to use stairs) and people who have an intellectual disability or brain injury. Handrails are used to steady and provide guidance as we ascend or descend the stairs. 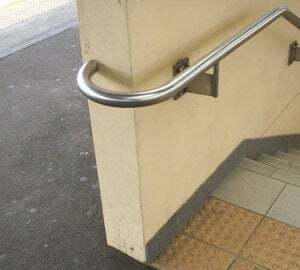 To ensure the stairway is as accessible as possible two handrails are required. 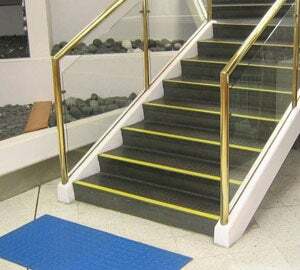 This assists those people who don’t have the use of both hands, in which case they may need to use either the left or right hand handrail as they ascend or descend. Effective handrails are ergonomically designed so that they can be used by all people, especially those with an impairment to their hand or arm function. 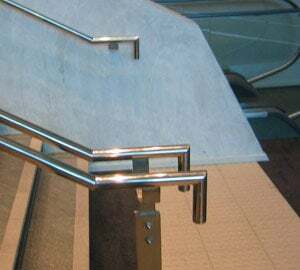 Continuous handrails that allow a user’s hand to maintain a hold on the handrail without the fixings breaking the grip assists in safe transition throughout the complete journey either up or down a stairway. 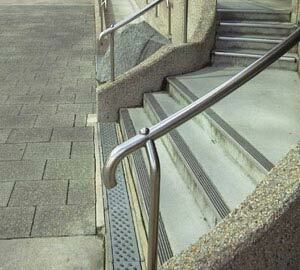 The ends of handrails must be designed to reduce the incidence of injury to pedestrians. 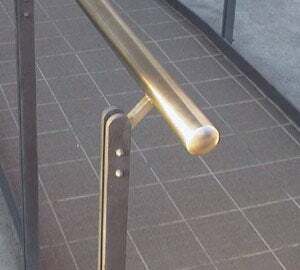 The Building Code of Australia (BCA) specifies handrails in D2.17 and D 3.3(c) where it refers to and requires compliance with AS1428.1. AS 1428.1 specifies technical details such as clearances, location, ergonomic and safety design criteria. To be effective handrails suitable for people with disabilities must be within the design criteria set out in AS1428.1. Clearances of the top arc of 270° are achieved throughout their full length. The ends are terminated by returning to a side wall or downwards onto a post or returning back 180° on themselves. Ends of handrails at the bottom of stairs extend beyond the last riser for the depth of one tread and then horizontally for at least 300mm. They are 30 – 50mm in diameter. 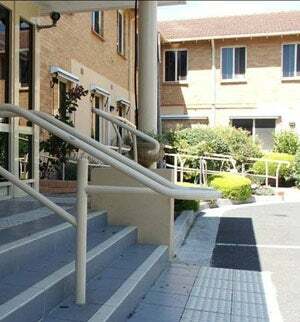 Raised dome buttons on the top of the handrail surface are only required on the ends of the handrails where TGSIs are exempt from being used, for example, in Aged Residential Care facilities. The handrails in photos 2 – 5 do not meet the specifications of AS 1428.1 for handrails on stairs suitable for people with a disability as they do not return to a side wall or downwards and back on themselves 180°. In addition the handrails in photos 4 and 5 do not comply with AS1428.1 because they do not have the required 270° top arc clear along the full length of the handrail or the minimum 15mm clearance under the handrail for finger and thumb transition as set out in the diagram below (taken from AS 1428.1 2009). Photo 6 shows the correct application of returning the handrail back to a side wall and the required 270° top arc clearance. Photo 7 has the alternative application of returning back on itself 180°. Handrails at the bottom of stairs should extend for the depth of one tread and then horizontally for at least 300mm. Photo 8 shows none of the required handrail extension features. 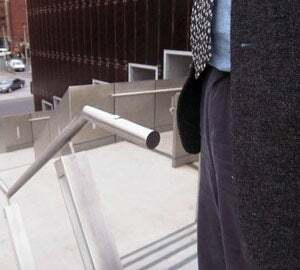 Photo 9 shows a handrail that appears to stick out into a path of travel. 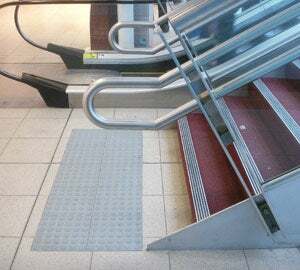 Care has to be taken to make sure the stairway is set back to allow for the correct handrail configuration so that the handrail does not encroach on the transverse path of travel. All too often the stairs are built hard up on the boundary line without the handrail configuration being taken into consideration. The handrail in photo 10 shows the correct interpretation of requirements for handrails in that they extend beyond the last riser for the depth of one tread and then horizontally for at least 300mm.